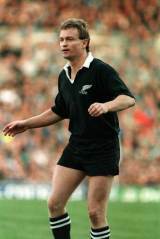 Grant Fox is a former New Zealand fly-half who was one of the game's greatest kickers. Despite not being a natural with the ball in hand he was a master in the art of goal-kicking. After impressing for Auckland he made his Test debut in 1985 against Argentina in Buenos Aires in a 33-20 victory. It only took Fox six games to amass 100 Test match points and two years later he won the inaugural World Cup on home soil scoring 126 points from six matches and finishing the tournament as the top points scorer. Fox scored 645 points in the 46 Test matches he played but only managed one try which came against Scotland in 1990. Fox played in the winning series against the British & Irish Lions in 1993 and scored a highly controversial match-winning kick in the first Test in the dying moments. He finished his international career against Samoa that year kicking seven penalties and two conversions in a 35-13 victory in Auckland. Since his retirement he has been on the coaching staff at Auckland and the Blues as well as commentating on television and after dinner speaker. However in December 2011 he was named as an All Blacks selector in Steve Hansen's new coaching set-up.